An incredible time to join the profession, don’t you think? What an incredible time to join the profession. This cohort of educators will never know what it is like to work in isolation. They will never know how it feels to work alone. They will have access to people, resources, tools and support at anytime of the day and from anywhere around the world. For these teachers, it will be common place to share, post and discuss lessons and ideas, not just within the schools, but across the world. It will be the norm to allow students to use a variety of tools and methods and to teach using a variety of strategies. For these teachers, teaching technology will seem redundant because it is the norm and they will find other innovations to discuss, manipulate, create and mashup. These teachers are coming into this profession at a time when educators across the globe are embracing a culture of customized learning – anytime, anyplace. 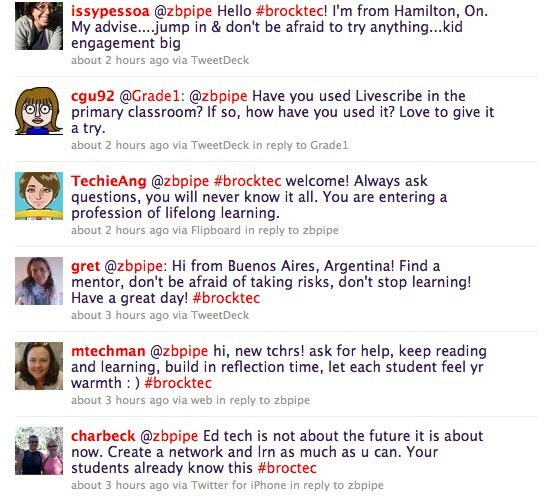 For this generation of teachers, networking across schools, cities, countries and continents will be a common practice. For these teachers, anything is possible. For the rest of us: Stay open minded, be a mentor and be mentored. Learn from them. This entry was posted in 21st Century Literacies. Bookmark the permalink. Yes, it is an awesome time to be entering the profession! 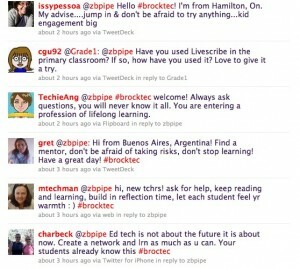 I have shared more resources on Twitter in the past 2 years than in 21 years in the classroom. As a studnet in Teachers College, I look forward to this networking tool and resource accessibility, which will foster the ultimate teaching mechanism for our students, our passion! !